Interlocutor: Master, today I won’t even ask you if you want to give some message, because I have many questions to ask you. Let’s move on directly ot the questions Do you agree? Interlocutor: The first question is related to the so-called “Ica Stones” you already know they are a kind of smooth stones with inscriptions of several types which were found in Ica, Peru. What intrigues me more is the enormous amount of these carved stones. Ruanel: Obviously they were not etched by terrestrial beings. Interlocutor: Not even by terrestrials with extraterrestrial tools? Ruanel: Not at all. Mainly because there are codes and languages. In some stones there are codes and in others there are etched languages. Interlocutor: Concretely, these stones were carved by extraterrestrial beings? Interlocutor: How long ago are we speaking about? Ruanel: We are speaking about a 1500 years. Interlocutor: Near the Incan area? Ruanel: Yes, near the mountain range. With this, I don't mean that they have been at the base of the mountains, because they have moved of places several times. Interlocutor: Was it an exclusively extraterrestrial base or was there also a terrestrial base? Ruanel: It was an extraterrestrial base but they were mixed with terrestrials and they taught them many things, even how to build pyramids. We already said in previous messages that most of the Aztec, Incan and Mayan pyramids were built by terrestrials but helped by extraterrestrials. Interlocutor: Of what age are we talking about? Ruanel: The aliens were at least during 1200 years, from the time you call Christian era until the year 1500 or 1600 more or less. Interlocutor: Where did they come from? Ruanel: From a very near planet to Arturo, but they don't have nothing to do with the Langar. It’s a star which is practically at six light years from Arturo. Interlocutor: What is the name of their star? Interlocutor: Summarizig, the aliens from Arbel IV appeared here at the beginning of the Christian Era. Ruanel: Yes, approximately around the year 0 and the year 90. Interlocutor: How many aliens came? Ruanel: Many, around 100 to 130. They came in several mother ships. Interlocutor: Did they also come with women? Interlocutor: And what was the reason they came here? Ruanel: Simply to settle down, to found a new civilization. Interlocutor: It seems that these things happens everywhere, as one commonly says. I refer to the desire of colonizing other worlds. Ruanel: Correct. They were always communicating with their native planet through subspatial transmitters. They had devices that transmitted Hertzian waves like those of the terrestrial radios, but these waves traveled, by means of quantum physics through space tunnels. Ruanel: Correct. They were very happy being here and they even reproduced on Earth, although in a measured way so that not to be spread too much. Interlocutor: How many aliens were? I ask it because you said that only 100 or 130 of them came to Earth. Ruanel: Notice that in the whole time they were on Earth they didn't exceed the number of 300 people. Interlocutor: Did they have children among them or they also mated with terrestrials? Ruanel: No, only among them. Besides, the aliens were very different, because they had a height of two meters the males and about twenty centimeters less the females. Not only were they taller, but also blond. Interlocutor: I presume that there was no physical attraction between them and the natives. Ruanel: Correct. I’ll give you one more piece of information: they have the same DNA that the homo sapiens sapiens has. Interlocutor: Then they were humans like the Aliens from Friendship Island? Ruanel: Correct. They were a very similar race, as much as in height and appearance. Interlocutor: Did they have white complexion? Ruanel: They were blond giants. Interlocutor: how many bases did they have? I ask it because I deduce that they did not have only one. Ruanel: There were five different bases of this race. Interlocutor: And each contingent came on alone? Ruanel: That’s correct. Each one came with a ship and they formed their own cities. For example, the extraterrestrial race that etched the stones we are talking about has nothing to do with the extraterrestrial race of Palenque (Mexico). Interlocutor: Now I understand. Is it correct to say that even though all of them came from the same planet, each contingent settled down separately? Ruanel: Yes, it is correct. Each one came with a ship and in different times. Interlocutor: what was the reason of their disappearance? Ruanel: Approximately during the year 1600 an order of the government of their planet came saying that they should leave in order to not interfere with terrestrials, since Europe was beginning its colonization trips. Interlocutor: When they abandoned the Earth, Did they abduct terrestrials? Ruanel: Some, not all of them. Interlocutor: I am wondering what kind of terrestrial residents were here in America at the beginning of the Christian Era. Ruanel: There were indigenous. As well as the pyramids of Egypt are previous to the Egyptian people, the pyramids of America are previous to the Incan, Aztec and Mayan civilizations. The aliens helped the natives to build them. Ruanel: Notice how ignorant the natives were, in spite of the extraterrestrial advances that the aliens had brought - they had even built cities of gold- . They continued with human sacrifices, killing to elected victims cutting their throats or casting them into a volcano. They were advanced on one hand, but very primitive on the other. Interlocutor: I remember exactly that in an opportunity Jorge incorporated the thetan of a person that had being there, who said that he had lived in that time and being a girl she was sacrificed on an altar. I even have very present that the thetan continued angry and I myself, through the dianetic technique, I made her go over the event to remove her charge, and with a lot of success. Do you remember that session? Ruanel: Of course. It was a very beautiful channeling. Interlocutor: Continuing with the Ica Stones, what function did they have? Ruanel: The aliens wanted to leave to the natives a record, to teach them how to use journal notebooks. These beings didn't communicate with notebooks made of paper as you do in the physical plane, instead they used a kind of journal notebooks that are something like quartz monitors in which one could write. They could even record the voice and manipulate the signs as they appear. That, obviously, could not be taught to those natives, and it was much easier to carve the stones to teach them, whether with a sharp device or directly with a laser ray. Interlocutor: Did the natives understand something of what they tried to teach them? Ruanel: In fact very little, because their decoders had very low development. Interlocutor: I wonder why they insisted with the teachings if they saw that they didn't have great reception. Ruanel: A little bit because of pride, other reason was for the desire to teach them how to advance. But they saw that it was fruitless because of the very complex language they had. Notice that these aliens had 64 vowels and consonants, the double of the vocabulary that you have. And above these things, they used signs that represented animals, plants, objects. Interlocutor: The strange thing is that all these stones, -more than 100.000- appeared in a single place. Did the aliens put them there? Ruanel: No, the local residents did it. 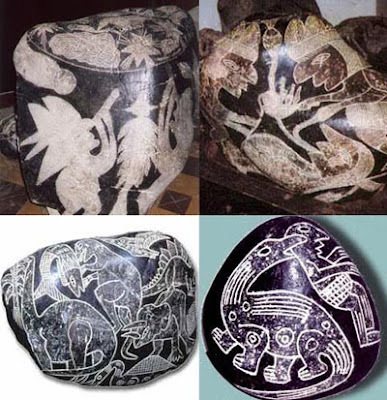 Interlocutor: There is another thing which is intriguing to me, why the researchers did not realize that the stones could never be carved by the natives, since it is obvious that they had to be made by extraterrestrials. Ruanel: Let’s use common sense: if the teachings etched in the stones were made by terrestrials, it is obvious that they would have passed those teaching from generation to generation. But those teachings were lost when the extraterrestrials abandoned the planet because the vocabulary used didn't belong to the natives but to the aliens. Ruanel: For heritage, it would have continued. The same Latin that today on Earth is a dead language, has continued from parents to children, and not everything has been written. Interlocutor: In short, some of the native tribes moved the carved stones to a single place and they didn’t know exactly what they were for. Ruanel: Correct. As well as there are experts that at the present time can decipher the Egyptian hieroglyphics, there are also those who can decipher the teachings that offer these stones. Interlocutor: I don’t understand why they have not did it. Ruanel: There is a total indifference. Interlocutor: Do the stones have something more? I mean if they are radioactive, for example. Ruanel: They had radiation when they were manipulated, and it is probable that some of them still have radiation. Interlocutor: Is that radiation dangerous? Ruanel: No because it is minimum. Interlocutor: To sum up the idea. Do these stones have some likeness with CDs that we use now with computers? I ask it because I have watched some science fiction movies where similar stones were put in an artifact and a voice was listened and even images were seen. Ruanel: No, because they are rough stones. Ruanel: At first, the aliens thought to make them with indestructible materials, of the type of current CDs, in order to leave to terrestrials their teachings, but they didn't do it because they knew that many hundreds of years would pass, maybe millennia before they could invent the appropriate device to listen to them, and then they thought that it didn't make any sense to waste time on that. It would be something as if you left a collection of CDs to a tribe of monkeys with the idea of returning in a million years to see what they did with them. Interlocutor: I get the irony perfectly. I don’t remember if you told me how these extraterrestrials were called. Ruanel: No, I didn't. Let us call them "Arbelians." Interlocutor: Okay. Is there something else to add on this? Ruanel: No, that is all. This entry was posted at Tuesday, January 05, 2010 and is filed under Extraterrestrials . You can follow any responses to this entry through the .